Almost exactly one year ago, on a trip to Boston for Valentine's Day weekend, Lynn and I wandered into the Harvard museums and found a small exhibit about an excavation that had been done in Harvard Yard in 2007 in search of the old "Indian College." Founded in 1636, just 16 years after the arrival of the Pilgrims at Plymouth, Harvard was formally chartered for "the education of the English and Indian youths of this country." The first brick building on the campus was the Indian College, built in 1655. The Indian College was funded by an English charitable foundation, the Society for the Propagation of the Gospel in New England, and it eventually housed the college printing press, which produced John Eliot's Indian Bible. Because we know how it all turned out for the Indians, it's easy to be cynical about the motivations of the founders of Harvard College in educating Indians. Yet, as in much of American history, there's an idealistic and utopian quality to the mid-17th century Puritan vision of how relations might be between whites and Indians. Harvard's first President Henry Dunster is quoted as saying he desired “to make Harvard the Indian Oxford as well as the New-English Cambridge.” The vision put forth was one in which Indians and English were bound together in scholarship, with Indians not just learning English and the ways of Christianity, but teaching their language and ways to to the white students as well. Although I've been a little under the weather this week, I've been quietly starting work on a new print about the first native Americans to attend Harvard. This Saturday and Sunday, February 13-14, Davidson Galleries will be hosting the Seattle Print Fair, a gathering of 11 print dealers from the U.S. and Canada. 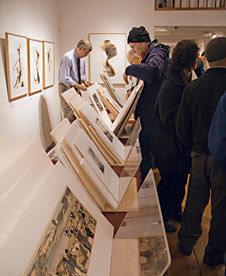 The fair offers an opportunity to see thousands of fine original woodcuts, lithographs, and etchings and to speak with expert dealers about the prints they are selling. Admission is free. If you go, be sure to stop in at Cullom Gallery on the upper floor and see some of my work! Beth Cullom is wonderful to talk with and she has a fine and eclectic collection of Japanese and Japanese-inspired art on paper. A few days ago I had a meeting with Zea Mays Printmaking director Liz Chalfin to talk about offering a printmaking workshop that would meet once a week over the course of several weeks. As we were talking about ordering supplies, Liz asked me if I had ever used Akua Color inks for moku hanga. In fact I've only used Guerra pigments (see sidebar for link) so Liz gave me a little box of Akua Color that she had on hand so I could try them out. I decided to test the inks by making some quick valentine postcards. First I pulled out some old blocks that I had used for various prints in the past. Then I cut some paper scraps down to 4" x 6", and cut a 3.5" x 5.5" window out of a 6" x 8" piece of acetate. This would allow me to frame and isolate any portion of the various blocks for printing. I had three Akua colors, crimson red, pthalo blue and hansa yellow. I used them straight out of the bottle, tinting them by adding water rather than adding white and I printed as usual with a baren. I worked very quickly, as I was just trying to get a feel for the inks. They worked beautifully, pretty much exactly the way the Guerra pigments do, and they dry to the same matte finish that I associate with moku hanga. I think I'll use them at the workshop. Almost exactly one year ago, on a trip to Boston for a long weekend, I first encountered John Eliot's Indian Bible at an exhibit at Harvard. Eliot's Bible was the first Bible printed on American soil, printed in 1663 at the Harvard Indian College, and it was entirely written in the Wampanoag Algonquin language. 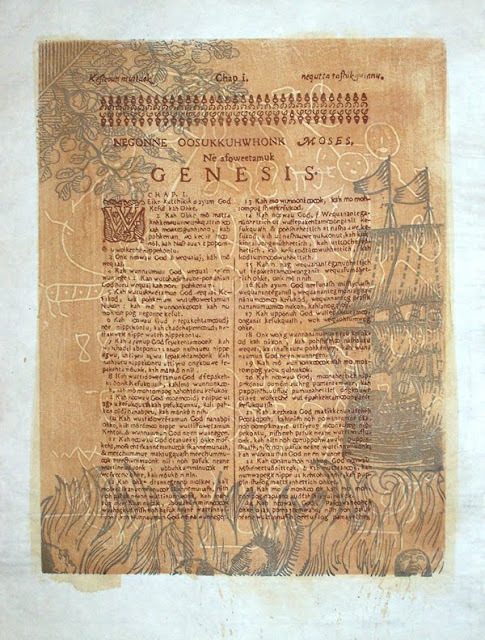 Eliot's intention for the Bible was to aid in making the Algonquians into Puritans, but since Eliot never really became a fluent speaker, his translations were done with the aid of Massachuset Indian minister John Sassamon, Algonquian journeyman James Printer, and probably others. Although the Eliot Bible did help make Indians into Christians, the multicultural nature of the translation process also helped make Christianity an Algonquian religion, as the translators made the Bible their own. The Bible was used for nearly 200 years until about 150 years ago when the language died out. In 1993-94, six generations after the last native speaker of Wampanoag had passed, a Mashpee linguist named Jessie Littledoe Baird (read this article about how she came to the project) co-founded the Wampanoag Language Reclamation Project, beginning the daunting project of reviving the language. The John Eliot Bible is playing a major role in this project as one of the primary texts that has preserved Algonquin grammar and vocabulary. I read once that every 2 weeks one of the world's 7,000 languages vanishes. Most of these dying languages belong to indigenous communities that have been stamped out or homogenized by the forces of colonialism and globalization. Languages are repositories of thousands of years of a people’s science and art, observations and understandings, and each disappearance is a loss not only for the community of speakers, but also for our common knowledge. The irony, or maybe one could even say the grace, of John Eliot's Bible is that it was a powerful force of colonization, yet it is now being used as a powerful means of decolonization and reclamation. This is a truly American story. As American Evangelicals still believe today, the 17th century English Puritans believed that there could be only one true religion and that all others, including Indian religions, were false. Some Europeans questioned whether Indians had any religion at all, but most of those who observed the natives first hand acknowledged, "all feare some God, some God they worship all" (William Morrell). Many writers believed that the Indians were descended from the Lost Tribes of Israel, so they searched for traces of Biblical knowledge in Indian consciousness. They were convinced that it was "meerly through ignorance of God and Christ" that the Indians ran headlong "into distruccion and perpetuall damnation" (John Rolfe) and that all the Indians needed was to see examples of Christianity to draw them from their paganism. Indians were indeed intrigued with Christianity, and a number of them converted, but not always in the ways that the missionaries hoped. For the most part, America's natives maintained control of their own Christianity, appropriating Christian doctrine and ritual and integrating it into their own ways of worship and ordaining their own clergy. I printed the tree, the ship, and the Indian hellfire block separately, using acetate to mask unwanted areas such as the right hand portion of the ship. The last thing left to do is print the Bible text. As I've been working on this series of "Pilgrim prints" I've drawn on any number of old colonial engravings and woodcuts both for style and content. No worries about copyright, as these items are old enough to have been in the public domain for centuries. But I've noticed something along the way. Early American printers and publishers used to copy each other all the time. Above is a page from the book Colonial American Printers' Ornaments & Illustrations showing four different versions by four different 18th century engravers of the same illustration, an illustration of the martyrdom of John Rogers that's probably based on an even earlier 17th century English engraving. There are many examples of this throughout the book. The First American copyright provision was the Copyright Act of 1790. This act, modeled on the English Statute of Anne, granted authors a monopoly on their writing for a period of fourteen years and the right to renew for another fourteen years. It was not until 1909 that the laws were expanded to include illustrations, maps and other graphics. And now look at the mess we're in. As you can see, I'm carving this on a previously-used block. I like recycling as much as possible (see previous post on re-using blocks). I drew this with a fairly large-tipped Sharpie pen, and as I carve I'm being careful to accurately preserve the qualities of the drawing - the rounded ends of the lines, the thicks and thins, the blobs created by the marker. I like the idea that this is a woodcut based on an engraving that will look like it was drawn with a Sharpie. Nice mix. When I first started the We Are Pilgrims series I intended to re-use some of the main keyblocks, thinking of them as characters in a narrative that would repeat. In a few cases I did use blocks in multiple ways. I used the ships a few times, repeated the little cluster of Pilgrims in two different prints, but overall I didn't repeat the blocks as much as I thought I would. For this print of John Eliot's Indian Bible, though, I'm re-using a couple of blocks. Since I'm representing the first page of the Bible, Genesis Chapter 1, it seems fitting to use the Tree of Knowledge and serpent that I carved previously for the American Bible Story print (photo above). I needed to isolate just that portion of the keyblock, though, and I needed to situate the block in the appropriate spot on the new print, so it required some figuring. Then I placed the acetate over the block in the registration board and printed the Tree of Knowledge onto the Eliot Bible print.